To make, start with say 2 kilos of beef, I just purchased the packages at S&R labelled “mechado,” and cut them into roughly 3/4 inch cubes. I found the ones from S&R were a bit big so I cut them in half. Next, heat up a large heavy enamel cooking pot such as a Le Creuset, add a couple of tablespoons of olive oil and sear the beef and brown the cubes, doing this in 2 or 3 batches if necessary, then removing the beef to a plate and setting this aside. When all the beef is seared, add it back to the pot, add some chopped garlic, several cups of chopped or crushed tomatoes or passata, some bay leaves (I used 2 fresh, 2 dried), a tablespoon or two of white vinegar, a couple of tablespoons of soy sauce and let this simmer for roughly 1.5-2.0 hours or until the beef is tender. You may also add a little water and some folks like to add a beef bouillon cube to give the sauce more depth or flavor. This looks really good. I definitely will try it soon. I do buy my meats from S&R because they are handled properly. Thanks for the mouthwatering photos. I didn’t realize it’s easy to prepare. I normally cook beef asado but I’ll try this to have something different. Thanks for the recipe, MM. I just had beef stew using my crockpot…and mechado was a common staple as well. I’ve relied a lot on crockpots and pressure cooker to save time (hehe, sourgrapes…don’t have a le crueset:) ) Is there a difference in using fresh bay leaf as against dried or using it both? I wonder if you can get them at the markets only…That Mechado definitely looks yummy. I love such dishes (stews, or tomato sauce based dishes)..
Isn’t this the same as Sinarsahan? Pardon my confusion too—what IS the difference between beef mechado and caldereta. I also notice a similarity with that of the beef goulash (except that it is spicier)? I also love mechado. When I prepare it, I would first marinate the beef in toyo-kalamansi before searing the meat. The traditional way of cooking mechado, as I was told by the senior cooks in the province, is to actually â€œmitchahanâ€ the beef. This is done by inserting strips of pork fat through the length of the beef. And that is how I prepare mechado when I cook for special occasions. To prepare: take a slab of beef, around 2 kilos (I prefer using kenchi or kalitiran) and about Â½ kilo of hard pork fat. Divide the beef into 4 parts, roughly the size of an average forearm. Slice the pork fat into Â½ inch strips . Note: the pork fat should be as long as the length of the beef. Using a sharp, thin-bladed knike, make a 1 inch, and end to end, lengthwise incision at the center of the beef. A bread knife is handy for this purpose. Insert a strip of pork fat into the hole. An easy way to do this is to spear one end of the pork fat with a barbeque stick then slide the fat into the hole with the aid of the stick, until the pork fat emerges at the other end of the hole. Marinade the â€œna-mitchahangâ€ beef in toyo-kalamansi for 2 hours or more. Proceed to cook as was describe in the post. That is: sear the meat in hot oil until golden brown. Remove some of the excess oil and on the same pan, sautÃ© lots of chopped garlic, onions and tomatoes, add the browned beef and marinade. Put some bay leaf, add water and simmer for 2 hours or until tender. When almost done, add cubed potatoes, carrots and bell pepper. Season with salt and black pepper to taste and simmer further until the vegetables are done. The slow cooking would have rendered the pork fat, moistening the beef and enhancing further the flavor of the meat. 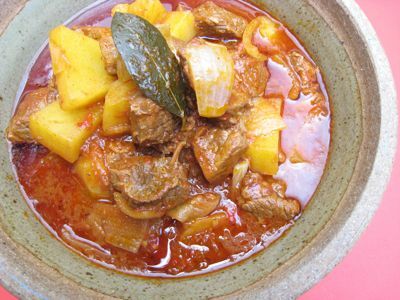 As far as I know, mechado is a type of beef stew so that makes it a kind of caldereta. Caldereta being a generic term for a stew. siopao, thank you for that, and yes, traditionally a piece of pork fat is inserted into each large piece of beef, a step I did not describe in the main post above and which I did not do… sonnysj, thank you so much for those tips, will have to try the more authentic version the next time around, the strip of pork fat is a critical step, apparently. Not to say that your Mechado does not look delicious, but the way the fat makes your photos glisten, it is just screaming: “clogged arteries!” Got to love the old Spanish/Filipino recipies– they may not be the healthiest or the easiest to prepare, but they sure taste good. MM, Siopao, Sonnysj- we often do a shortcut and just put in a few slices of fatty pork (belly) in the stew to add flavor (i.e. fat!) to our mechado. The pork becomes super soft and almost dissolve into the sauce, thus making it even more delectable and sinfully rich. Rice please!!!! MM, the Mechado of my childhood always had fat on lardon on the center. My Aunt starts with a log beef, a slit made in the center to which a strip of fat is tucked in. The vendor at the wet market would happily do that first step. The log of beef is browned then stewed in whole. Once the meat is tender and the sauce reduced, the beef is then sliced just before serving. You could see the juice rolling down as you slice the meet into 1/2 inch thick discs. Pork in an armor of beef. Definitely falling under single-use implements, I picked up a mean-looking larding iron some twenty years or so ago to simplify the insertion of wicks (mecha) of pork backfat into slabs of beef, saddle of venison or oxtongue (for lengua mechada). Using this tool was as difficult as doing it with a piece of bamboo which mother used at home so it thereafter got relegated to a corner of a kitchen cupboard. One day the person finding it will probably seek counsel from Cooks Illustrated to find out what sinister use it might have been designed for. What a coincidence to find this post tonight, that’s what we had for dinner! But we call that calderetang baka. 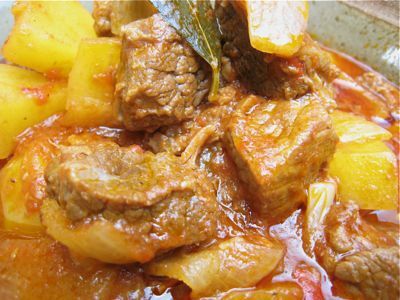 I favor tomato stewed meat with bay leaf. Honing/sharpening steel is my choice of tool in making a tunnel in meat to fill in with pork fat or crushed/whole garlic in roast beef, pork loin or in this case mechado. we also marinate the beef in toyo-calamansi…instead of vinegar, we add pickles…. I gather that mechado meat is cooked in whole like a log with pork fat inserted in the middle as per the comments :). See, I havenâ€™t cooked Mechado as yet. Itâ€™s interesting to know that caldereta and mechado looks the same, however they are 2 totally different dish. Mechado having the least ingredients but somewhat complicated to cook (with the incision of pork fat). 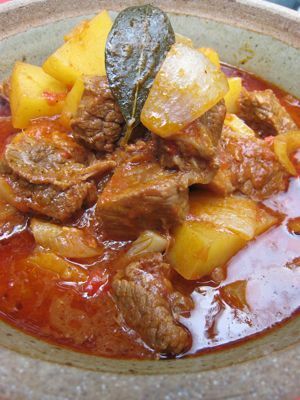 While Caldereta calls for more ingredients, but the beef is simply cut in cubes, then browned before adding the liquid and the rest of the ingredients! And oh yeah let me not forget, I cook the potatoes separately in a pan first before adding it to the meat. I cooked Caldereta quite a lot, but I could never achieved the â€œright tasteâ€ just the way my (deceased) uncle makes it. I tried, but he never revealed his secret ingredient (s), he would just say to me with a smile on his face that it’s his connection with his pan and some “whisper” will do it’s magic! I would try this recipe soon and Iâ€™ll make sure to remember sonnysjâ€™s pointers for this dish! Thanks! dhayL, I suspect the secret ingreient was liver spread from a can, I think that is what distinguishes a caldereta. michelle, yes, your latter description sounds like a morcon, I did a post on that here. Fabian, I guess it should be spelled mitsado instead. :) Apicio, now if we have the larding iron done in sterling silver, we would have a new fishpan level single use implement… Teresa, gotta try it the way so many of you describe it… pork fat it beef… yum. Is mechado the same thing as stew beef? I tried a very similar recipe recently, and the beef came out quite tough. I seared the beef chunks, then simmered for about two hours…I wonder if I used the wrong cut of meat? michelle, what you describe sounds almost like what I remember as ‘morcon’ and I can’t remember the last time I had that! My dad was the expert goat caldereta and bacalao chef in our household. Nobody was allowed to cook those 2 dishes but him. I remember that both dishes required a long list of ingredients and tons of prep work like browning potato wedges in olive oil which were sooooo good, he had to make triple extra because we would steal them quicker than he could cook them. We would also feast on the stuffed olives which both dishes required. I can’t remember the last time I had either dish either – this is making me reall sad – sigh. Actually, I did have bacalao in Madrid when I was there in the 70’s but man, that was a loooong time ago! My Mom puts kalamansi juice in her Mechado. one MAJOR difference between kaldereta and mechado is that kaldereta is PERFECT with bones (whether goat or beef) while mechado is DEFINITELY boneless. goat kaldereta is the best! with papaitan soup– goat skin (i think) soup soured by goat bile– to end. delicious!!! with white rice its perfect!! I find that this preparation is more presentable when having company over for dinner. You can carve half of it into slices and place the other half on the same serving platter. Surround the meat with the potatoes, and maybe even some baby carrots. I also like to cook (fry) the potatoes separately like dhayL, otherwise they get too mushy. Question: Instead of larding the meat, can one just use more marbled cuts like short ribs? Would that work? MM, you’re right, kaldereta is similar to mechado but with other add on ingredients, plenty of onions esp if using goat’s meat say a kilo of onions for a kilo of meat, whole pickles/or relish,queso de bola/or quick melt cheese, chopped pork liver/or liver spread, bell pepper, worcestershire sauce, and siling labuyo for that hot chili taste. for shortcuts, i pressure cooked the meat for 10 min and then simmer it using slow cooker or other pot. Isn’t what you described (your dinner) morcon? It sounds like morcon to me than calderetang baka..
Yummy, this looks good. I wish to try your recipe, so I have a question. Do you use “filipino” soy and vinegar (e.g. silver swan or marca pina brands and cane vinegar like datu puti?) or do you use kikoman soy and regular distilled white vinegar? What’s passat? Thank you! I will try this soon, though we eat more chicken. So I’m guessing this is similar to afritada chicken. you are describing morcon, not mechado. your mechado looks really savory and delicious. must try it soon. keep all the great info/recipes coming. Does anyone add or ever heard of whole boiled eggs being added to mechado? I came across this interesting addition many Christmases ago. With or without the eggs, though, the mechado was excellent, it was the heartiest, richest mechado that I had ever tasted. The lady who cooked this also made the best spaghetti bolognese I had ever tasted, as well. I came to know this lady through my ex and only got to enjoy her culinary masterpieces once a year at her Christmas get-together. Sadly, when my boyfriend and I broke up, I lost access to the best bolognese sauce and mechado that I had ever had. Marketman, I will definitely try your mechado recipe. Do you have a super-rich bolognese sauce recipe you could share? Last but not least, people look at me funny when I rave about a box of puto-flan that a friend brought back from the Philippines. I hope that someone else out there has tried them. Hopefully, they’re available here in the U.S. Thanks and peace…. thanks for sharing your recipes.ill try it! Hey, MM! I tried this with French fried potatoes, the store-bought kind. Adds a nice touch because of the different texture, and also hubby has an aversion to boiled potatoes for some reason. Yuuuuummmeee mechado recipe, and I will definitely use this again. the recipe sounds so simple and yet looks very yummy on the picture. I am going to try to cook it for the party tomorrow. Haven’t tried it before so fingers crossed i hope it turns well for me and for the the people who are going to eat it. Keep the recipes coming and I shall keep an eye out for them. Thanks for the recipe, Marketman! This definitely looks yummy. I’ll be cooking this for my Mom and Dad’s anniversary this sunday.